Happy Friday! 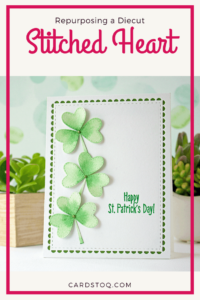 I wanted to make a shamrock themed card, and I didn’t have any dies in that particular shape. Well, I did, but I can’t find them in my stash. 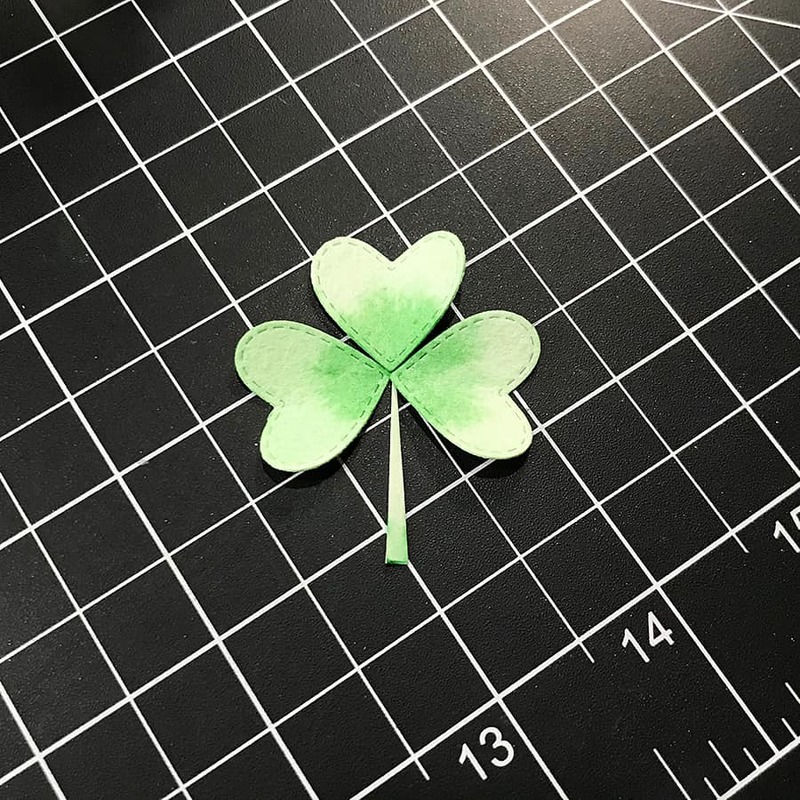 The die I used today to make the shamrocks is Triple Stitched Hearts by Memory Box, but it’s a little hard to find. I linked to a couple of shops below where I saw it in stock, but you can just as quickly use any heart dies you already own. 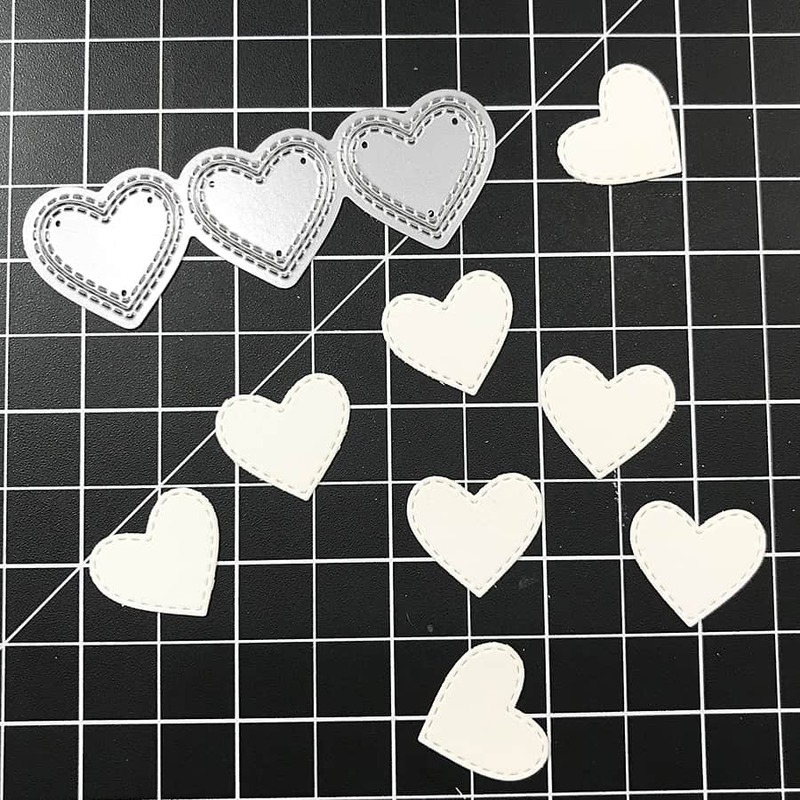 First thing I did was cut out 9 hearts from Strathmore watercolor paper since I planned on dabbing them with a little watercolor paint. 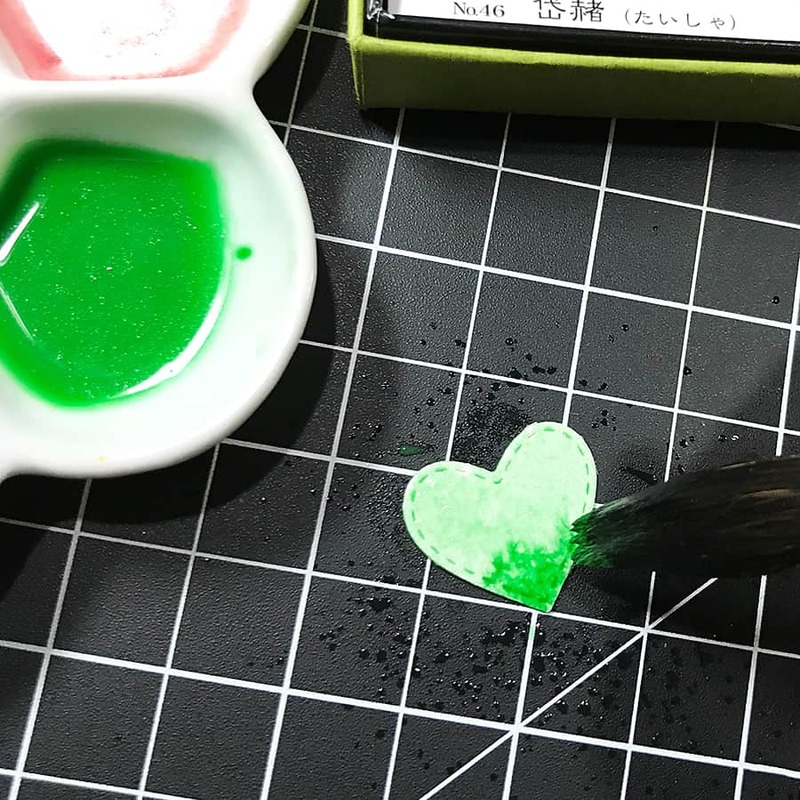 I used a spray bottle to get the hearts damp, then did a light wash of green over them with the watercolor paint. Next, I added a bit more concentrated green color to the bottom of each heart and let it do its thing. Once they had partially dried, I bent them a bit with my fingers so they would lift up off the card front when I attached them. After that, I let them dry completely. Then, to make the stems, I snipped off a piece of the edge of the watercolor paper I was using to cut out the hearts. I gave those a light lick of paint to match as well. To put together each shamrock, I dabbed some Aleene’s Tacky Glue on the tip of each heart and assembled them on my work surface to dry. Don’t worry about if your tips overlap a little. It’ll be hidden on the card. Next, I die cut the white panel out of Marshmallow cardstock with the die from Reverse Confetti. 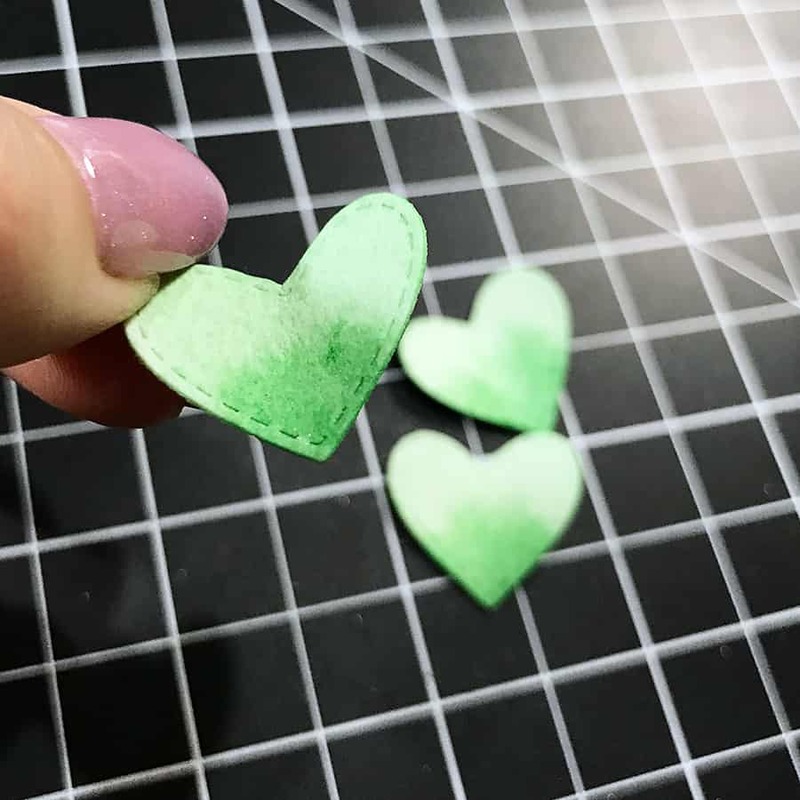 Use it as an overlay for a 5.5 x 4.25-inch piece of the Gumdrop Green cardstock. 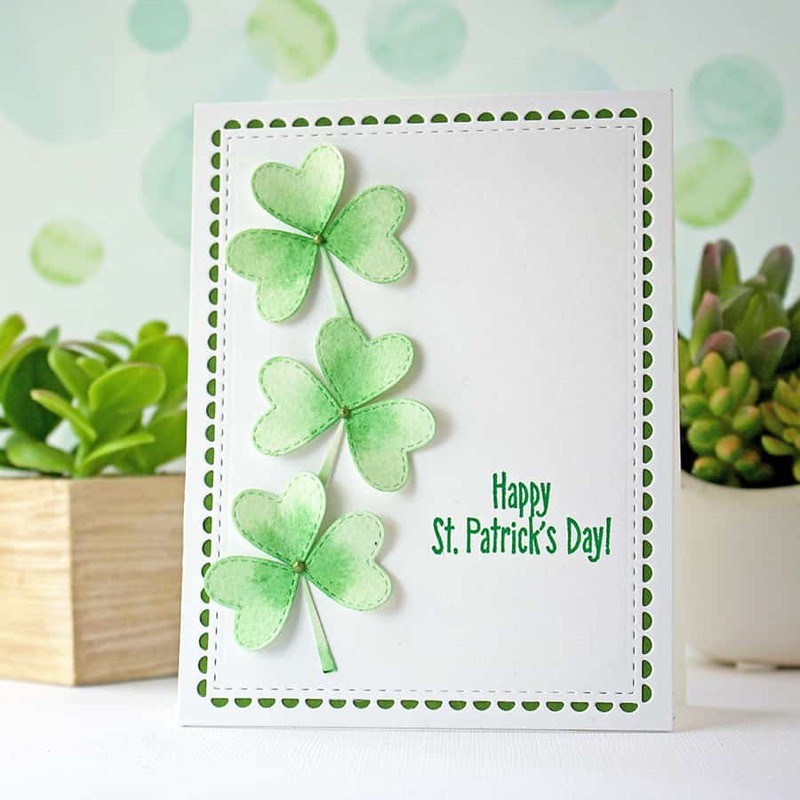 When the shamrocks are dry, go ahead and position them on the card front. I stamped my sentiment with Versafine Clair in Green Oasis beforehand so I could get the right positioning for the shamrocks. Then, I adhered them with a few well-placed foam squares. 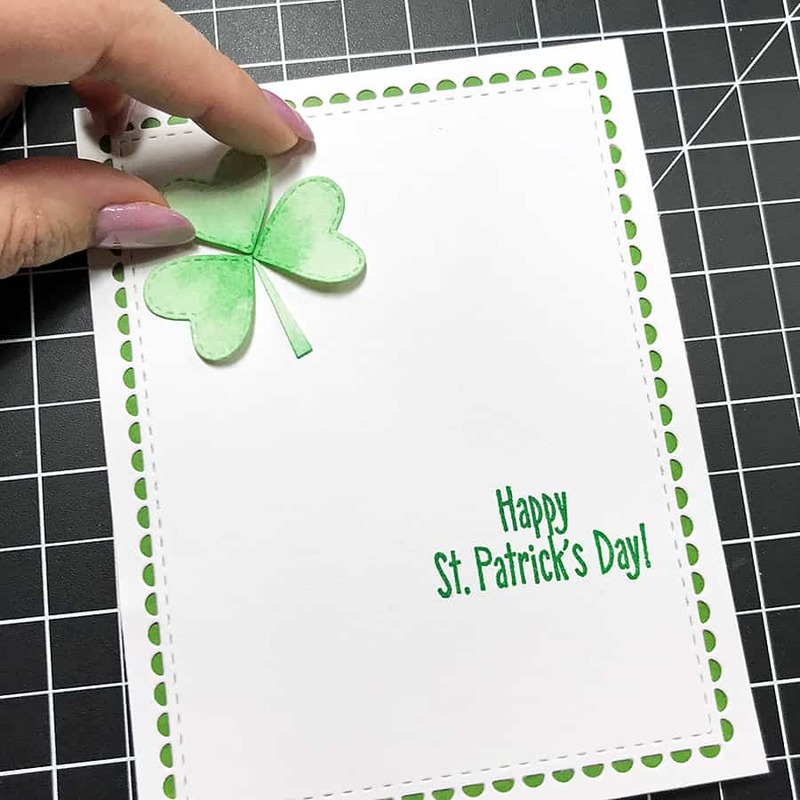 To complete the card, I mounted the finished card front onto an A2 sized card base and added a “pearl” to the center of each shamrock with Nuvo Crystal Drops in Bottle Green. Thanks for stopping by today – I hope you found some ideas for repurposing diecut shapes too! Interested in coloring stamped images differently to match your project when you don’t have the right stamp? Check out this post.